Vancouver, BC - Skyharbour Resources Ltd. (TSX-V: SYH) (OTCQB: SYHBF) (Frankfurt: SC1P) (the “Company”), in conjunction with Preston Uranium Project partner Clean Commodities Corp. (“Clean Commodities”) (TSX-V: CLE), is pleased to announce the signing of a binding term sheet (the “Term Sheet”) with a uranium company (the “Partner”) which provides that the parties will work to negotiate a definitive option agreement that, if entered into by March 15th, 2017, would provide the Partner an option to acquire up to a 70% working interest in a portion of the Preston Uranium Project (the “Preston Segment”). In consideration for the 70% interest, the Partner would be required to spend up to CAD $8 million consisting of cash payments to the Company and Clean Commodities and accelerating exploration programs. Outlines the general terms of a potential Definitive Agreement whereby the Partner may earn up to a 70% interest in the Preston Segment totaling 52,428 hectares of the total 121,148 hectare Preston Project through $8 million of total project consideration over six years, including up to $7,300,000 of exploration work programs and $700,000 of cash payments. If carried to completion, a three-way joint venture would form allocated as to 70% Partner and 30% to be jointly split between Skyharbour and Clean Commodities. Skyharbour and Clean Commodities would continue to retain ownership (50% / 50%) of the balance of the Preston Uranium Project consisting of a further 68,720 hectares of minerals claims contiguous to the Preston Segment optioned to the Partner. 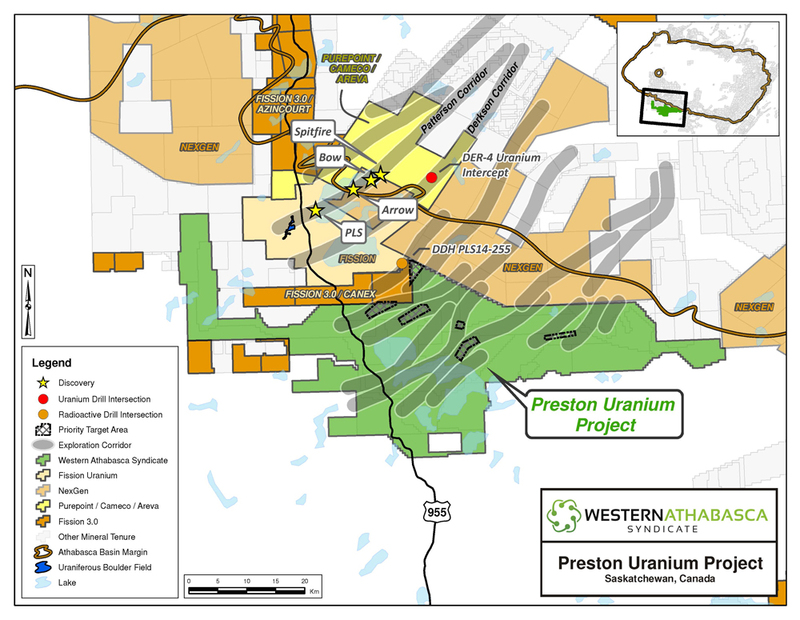 The Preston Uranium Project is one of the largest tenure positions in the Patterson Lake region and currently consists of 121,148 hectares strategically located near NexGen Energy Ltd.’s high grade Arrow deposit hosted on its Rook-1 property and Fission Uranium Corp.’s Triple R deposit located within their PLS Project area. The significant potential of the Western Athabasca Basin has been highlighted by recent discoveries in the area by NexGen Energy Ltd. (Arrow), Fission Uranium Corp. (Triple R) and a joint-venture consisting of Cameco Corporation, AREVA Resources Canada Inc. and Purepoint Uranium Group Inc. (Spitfire). Through its involvement in the Western Athabasca Syndicate and the Preston Uranium Project, the Company has been involved in a large regional exploration program in the relatively under-explored southwestern side of the Athabasca Basin since 2013. In excess of $4.7 million in expenditures on the Preston Uranium Project have been incurred to-date including ground gravity, airborne and ground EM and magnetics, radon, soil, silt, biogeochem, lake sediment, and geological mapping surveys, as well as two exploratory drill programs. Fifteen high-priority drill target areas associated with six prospective exploration corridors have been successfully delineated through this methodical, multi-phased exploration initiative which has culminated in an extensive, proprietary geological database for the project area. The Term Sheet was signed by all parties on December 14th, 2016 and represents an arm’s length transaction with no finder’s fees being paid. Skyharbour holds an extensive portfolio of uranium and thorium exploration projects in Canada's Athabasca Basin and is well positioned to benefit from improving uranium market fundamentals with five drill-ready projects. 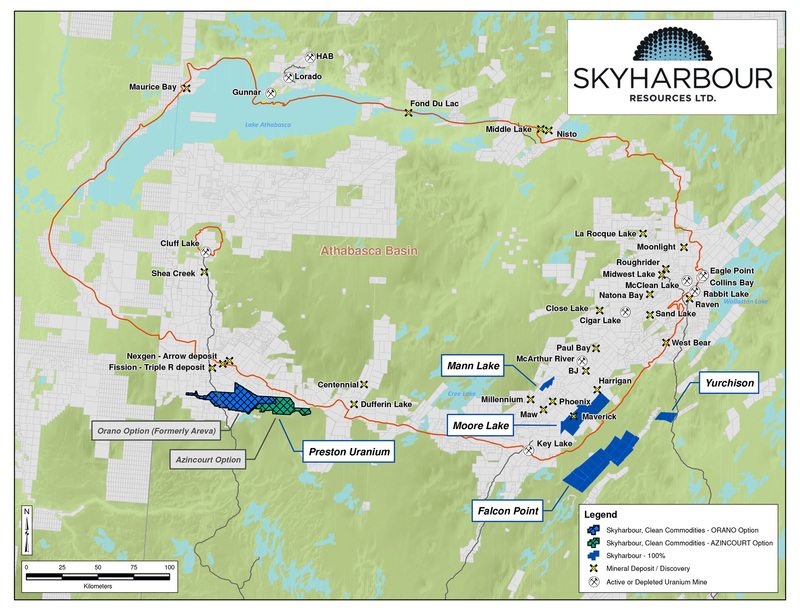 In July 2016, Skyharbour acquired an option from Denison Mines to acquire 100% of the Moore Lake Uranium Project which is located 20 kilometres east of Denison’s Wheeler River project and 39 kilometres south of Cameco’s McArthur River mine. Moore Lake is an advanced stage uranium exploration property with over $30 million in historical exploration, 370 diamond drill holes, and a high-grade uranium zone known as the Maverick Zone with drill results including 4.03% eU3O8 over 10 metres at a vertical depth of 265 metres. The Company owns a 100% interest in the Falcon Point (formerly Way Lake) Uranium Project on the eastern perimeter of the Basin which hosts an NI 43-101 inferred resource totaling 7.0 million pounds of U3O8 at 0.03% and 5.3 million pounds of ThO2 at 0.023%. The project also hosts a high grade surface showing with up to 68% U3O8 in grab samples from a massive pitchblende vein, the source of which has yet to be discovered. Skyharbour also has a 50% interest in the large, geologically prospective Preston Uranium Project proximal to Fission Uranium’s Triple R deposit as well as NexGen Energy’s Arrow deposit. The Company’s 100% owned Mann Lake Uranium project on the east side of the Basin is strategically located adjacent to the Mann Lake Joint Venture operated by Cameco, where high-grade uranium mineralization was recently discovered. Skyharbour’s goal is to maximize shareholder value through new mineral discoveries, committed long-term partnerships, and the advancement of exploration projects in geopolitically favourable jurisdictions.